The inspiration behind this image (and the model) was the Shorthike and SpaceStation Manager game (I believe this has released open source recently) which was a fantastic little game where you built spacestations taking into account energy generation, consumption, energy flows, life support, production, and labour. It was quite fun, and you could end up with some very believable looking designs. The spacestations were built out of a number of modules stacked together in different ways. I recreated the modules (some redesigned to suit my tastes) in Carrara. 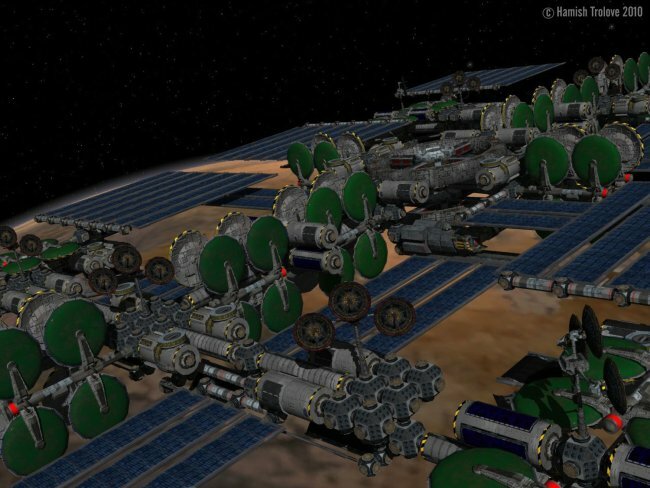 With a library of modules, it was quite quick to pull together a complex model based on designs created using the Shorthike or Spacestation manager games. The background image is from a screen capture from the Celestia universe simulator with the planet being a custom made texture that I made for a fictional solar system.